Cousins Thomas (Chan) and David (Biao) own and operate a mobile food truck called “Everybody’s Kitchen” in Barcelona, Spain. It seems they’re always getting into mishaps and misadventures, and their latest one involves Sylvia (Forner), a beautiful woman that both private detective Moby (Hung) and a gang of baddies are looking for. Eventually, Thomas, David and Moby team up to protect Sylvia, while fighting the gang. It’s impossible not to love Wheels On Meals. The Martial Arts and stunt choreography are superb, there’s plenty of humor that’s actually funny, and it’s all very well-shot, colorful and upbeat. It was an excellent idea to shoot a movie like this in Spain, because it gives the whole thing a different and unusual vibe not seen in too many other Martial Arts movies. 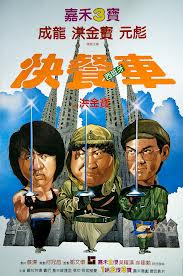 The whole idea of Chan, Biao and Hung as the Three Musketeers is very winning, and they would reunite a few years later as the Three Stooges in Dragons Forever (1988), but we prefer Wheels for all-out fun and entertainment. The movie STARTS with a training sequence, because Thomas and David may run a food truck, but they always have to be prepared to defend it from street punks. But this is one high-tech, futuristic truck. It’s all run by computer, which is very savvy for 1984. Sammo Hung looks pretty stylin’ with his Jheri curl and suit jackets rolled up to the elbows. He resembles Michael Jackson or Lionel Richie, which would make sense for the time this movie was made. It’s great to see the three leads interact, and with the addition of the gorgeous Lola Forner (who would return in Armour of God, 1986), you really can’t lose. From the scene at the disco (we always love seeing those), to the insane asylum (check out the “Clock Man”! ), and of course the cool stunts, there are a variety of situations and scenarios for our heroes to get into. Of course, we can’t forget to mention the awesome final fight between Jackie and Benny The Jet. Benny wears this bowtie and seersucker suit, which we imagine would be tough to fight in, especially the complex moves being done, but it all comes to a rousing climax in a Spanish castle. Benny would also come back in Dragons Forever (1988). 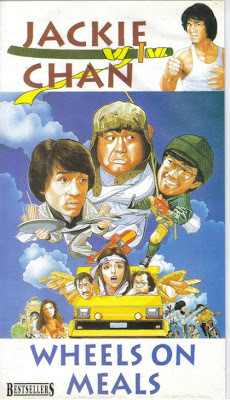 When we would go to the video store, we would always notice two Jackie Chan movies because of their unusual titles: Wheels On Meals and Half a Loaf of Kung Fu (1980). We would always talk about these titles - and thought-provoking names like these probably sucked many video store patrons in and then they later became not just Jackie Chan fans, but Martial Arts cinema fans as well, acting as a sort of gateway drug. Now we strongly recommend you watch the movie on Netflix Streaming if you have it. It’s a nice widescreen print with subtitles (funny how everyone in Spain speaks Cantonese). Surely it’s a vast improvement upon pan-and-scanned, dubbed VHS tapes. 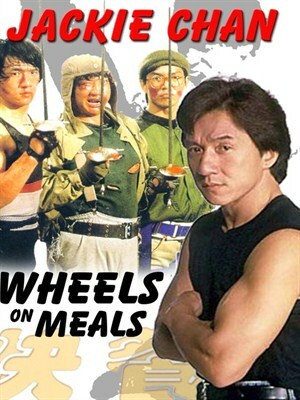 Wheels On Meals is a hugely enjoyable movie experience and a good time will be had by all who see it. This is indeed one of the finest Chan/Biao/Hung moments (and simply wu xiu moments) ever put to film and y'all do it justice. I just posted on another food-truck centric movie and mentioned this as a comparison. You get the link! Totally agree. Very well made. Dragons Forever is also solid. Well, combine two or three of these guys in a movie and you pretty much have a winner. It is so great they all teamed up to make this movie.